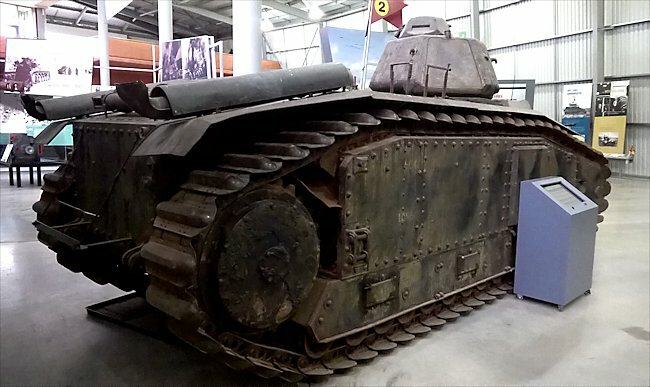 This Char B1 bis French heavy tank is kept at the British Tank Museum, Linsay Road, Bovington, Dorset. The nearest train station is Wool Railway Station. You can walk the 2 miles to the Museum but there are not pavements along the country road and if you are travelling with children it can be dangerous. It takes 45 minutes by foot. There is an irregular bus service from Wool Station that will get you to the museum but they only come once an hour in the morning starting after 9.30. The last bus back to the station from the Tank Museum is just after 13.45 which is really silly. There is no Sunday bus service. The easiest way to get to the museum from the train station is by taxi. They can be pre booked with Garrison Cars to meet you when your train arrives and pick you up for the return trip from outside the museum. Their phone number is 01929 463395. The word "Char" means tank from "Char de Bataille" which translated means "battle tank". Only three versions were made. The first tank was just called the Char B1. The second version with a bigger main gun was given the suffix "bis". The up-armoured third version was given the suffix "ter". 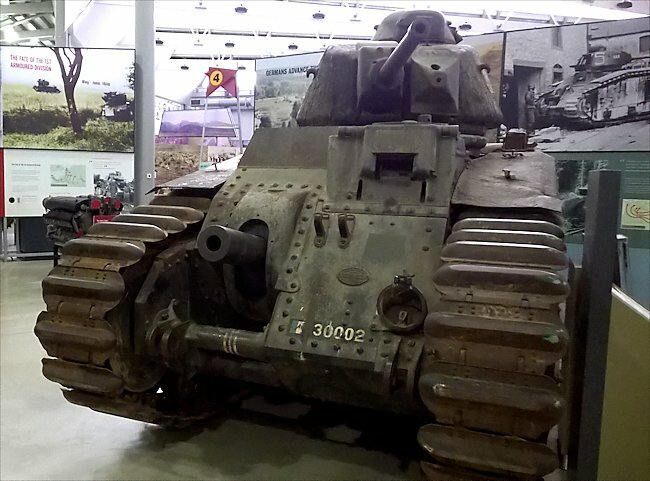 The Renault B1 bis heavy battle tank was the most powerful combat vehicle used on either side during the 1940 invasion of Belgium and France by the Germans. The French built 405 Char B1 tanks between 1935 - 1937 and 369 Char B1 bis tanks between 1937 - 1940. It had a 75mm ABS SA 35 howitzer in the hull and a 47mm SA 35 gun in the turret. It had two 7.5mm Reibel machine gun, on in the hull and the other in the turret. 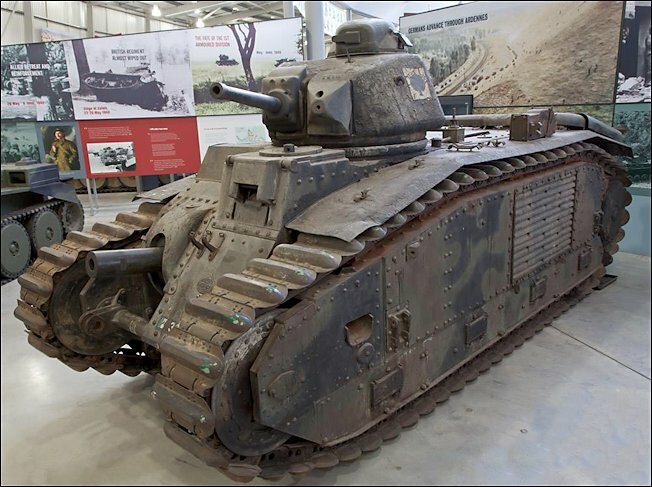 The Char B1 tank was powered by a Renault inline 6-cylinder water cooled 16.5 litre petrol engine that produced 272 hp. The tank weighed 31.5 tonnes and was very slow with a maximum cross country speed of only 21 km/h (13 mph) and on roads 25 km/h (16 mph). It had an operational range of around 200km (120 miles) before the crew needed to refuel. The maximum armour thickness on the Char B1 was 40mm but on the upgraded Char B1 bis it was 60 mm thick. The tank had a four man crew. The French supply system in 1940 was very poor. It did not help that many french tanks fought as infantry support vehicles rather than in one massed assault group. The supply trucks had to locate each individual small troop of tanks rather than go to one refueling and supply dump. Many Char B1 bis tanks were abandoned by their crews as they simply ran out of petrol and ammunition. A few were knocked out but a lot never saw action as the France surrendered before they could be transported to the battlefront in the north of France. The Char B1 tanks were deployed in small units and the Germans hit them with whole divisions. Therefore large numbers of Char B1 tanks were captured intact by the Germans in 1940. They were modified to take German radios and fitted with additional armour protection. 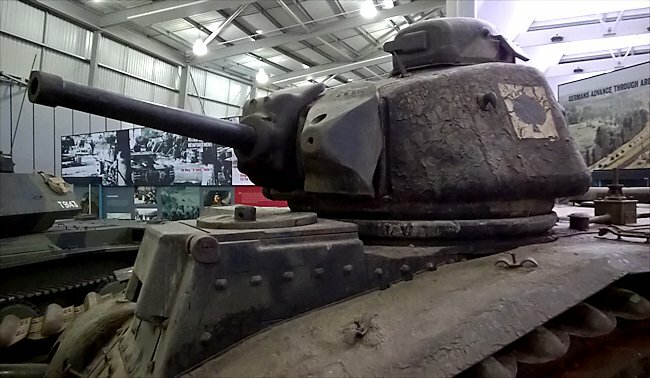 The welded armour on the top at the front of the Bovington tank was actually filled with concrete. Many were taken into service with the German Army. They were given the official German designation PzKpfw Renault B-1 bis 740(f) and saw action in Russia and the Balkans in 1941. Others were used for internal security and defence. The Bovington tank number 114, was issued to 1st Platoon, 1st Company, Panzer Abteilung 213, Panzer Division Schweizingen for service in the Channel Islands. The Panzer Abteilung 213 was formed in the autumn of 1941 to operate French tanks, and arrived in Jersey and Guernsey in March and April 1942 on the SS Derindje and SS Livadia. The Panzer Division Schweizingen never fired a shot in anger, although many of its tank crews had fought in other panzer regiments on the front line in North Africa and Russia. At the End of the war the British seized all the German tanks and weapons on Jersey. The tanks were returned to France in May 1946, all except this one. 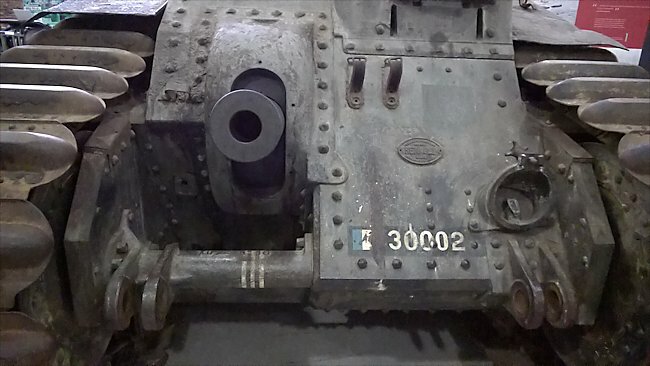 It was sent to the School of Tank Technology in Britain before being moved to the Tank Museum. The 75 mm howitzer fitted to the hull of the Char B1 tank fired HE High Explosive shells for use against, soft skinned targets like enemy infantry, machine gun nests, bunkers, supply lorries, anti-tank guns and artillery. The 47 mm gun in the turret fired AP armour piercing rounds for use against enemy tanks. the 75mm gun was the most powerful gun fitted to a tank at the time WW2 broke out but the design of the tank was poor. Both guns needed crew members who were already busy doing other tasks to operate and fire. Each gun really needed its own crew of two: gunner and loader. To operate properly the tank should have had a crew of six: two gunners, two loaders, driver and commander. There was not enough room in the tank for two additional tank crew members. The driver had to aim and fire the main gun whilst operating the track levers, accelerator, clutch and gear stick. The tanks APX turret was small and there was only enough room for one man. The commander in the turret had to load aim and fire the 47 mm gun whilst spotting enemy threats, giving the driver directions and reading a map. The tanks were not fitted with radios in 1940. The visibility inside the tank was poor and the four man crew were over stretched. There were 17 Char B-1s tanks stationed in Jersey: two command vehicles and fifteen tanks split into three platoons of five. Two platoons were equipped with standard tanks and one with Char B1 bis flamethrower tanks. They were called 'Flammwagen auf Panzerkampfwagen B-2(f)'. The unit was stationed just south of Jersey Airport and the flame platoon was tasked with airfield defence. As such they were housed in the grandstand for the local horse racing track. Some where used in Normandy 1944 fitted with flame throwers against the advancing allies. Records show that five captured Char B1 tanks were part of the operational strength of the German Panzer Abteilung (Battalion) 206, one was issued to Panzer Ersatz und Ausbildungs Abteilung (Battalion) 100 in Normandy. The Germans found that the armoured grill on the rear laft side of the Char B1 bis Tank was its main weak spot. Where can I see other Char B1 bis tanks?